Price: Free for me- thanks Salsero! Getting free tea is one thing, but getting great free tea is something entirely different. I have to say, this is the first Dan Cong that has truly impressed me, and it really blew me out of the water. First off, the dry leaf. As soon as I stuck my nose in the bag (Remember the Sam Adams commercials where they showed Jim Koch smelling hops? I'm almost that bad. ), I knew this was going to be interesting. There is an intense (See the bold face type? It's that intense.) aroma of peach and grapefruit— lovely! The leaves themselves are quite beautiful— long, dark, and delicate. As soon as hot water hits leaf, this aroma moves- I could smell it clearly even a yard (or a meter, for you metric-lovers and optimists). It is, without a doubt, the most aromatic tea I have come across to date. I tried to stay true to Imen's parameters, and they seemed to work out pretty well. I used ~4.5g of leaf in a 100mL gaiwan, and tried to take as much of her other advice as possible. I had to use a cha hai though, because I don't have enough matching cups— yes, I know I'm hopeless— to hold all the liquid from my gaiwan (you can see my awkward attempt to get around this in the video below). The tea liquor was interesting. True to its dan cong nature, the flavor was not as pungent as many other teas (particularly yancha), at least not in the first few steeps. I'm not sure if you caught that the first time, but yes, I said the first few steeps. This tea produced an insane number of infusions, but sadly I lost count. Definitely well into the teens, though, and I stopped because I got tired, not the leaf. Still, even though it persists for a long time, the light fruit/perfume flavor is never more than mediocre in strength, as one would expect from a dan cong. Also of note: take a look at the wet leaf. See those little holes? Not the tears, those are my fault, but the little holes with red marks around them. If I presume correctly, those are bite marks from insects. Not only is this proof of the tea's organic nature, but I think it may also explain some of the tea's intense fruitiness. 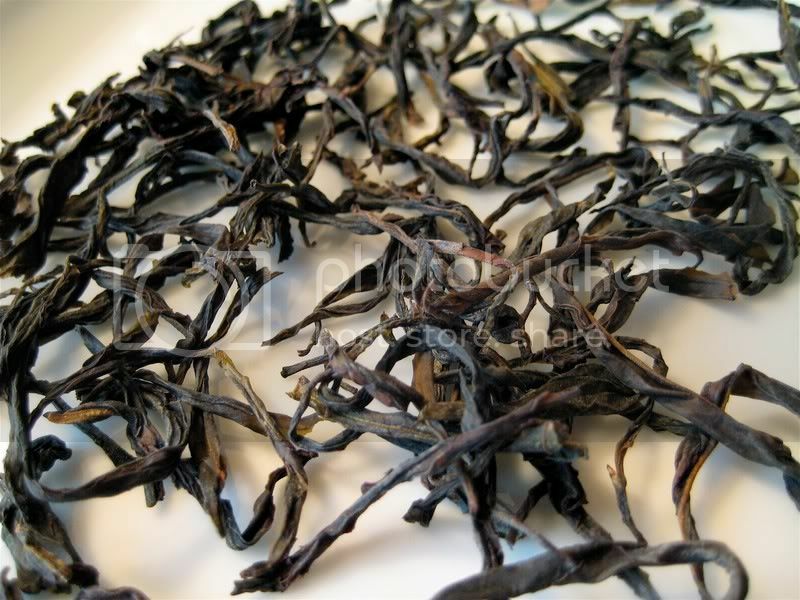 Bai Hao and Muscatel Darjeelings are known to taste fruitier when bitten (something to do with the leaf reacting to damage, and producing more juices/goodies), so perhaps this is a similar phenomenon? This was a spectacular tea, as one would expect considering the price it commands. If the other teas Salsero/Imen sent are anything like this one, I am in for quite a treat. Thanks again Salsero! If you are curious about my interpretation of Imen's directions, you can check them out here, in Wrong Fu video #2! So, the inevitable question is, "Which infusion are we viewing? Number 1, 3, 10??" Nice review, photos, vid. Thanks for posting. Ah, thanks for asking. That's the first infusion. For the others, I didn't use such a forceful pour. ...could that be a too long of a 1st brewing? Love the blog! Could you tell me the purpose of holding the kettle so high when pouring the water? I believe the high pour helps to "wake up" the leaves by agitation, which causes them to release more flavor/aroma. That's just a guess though, I don't know for sure. I do it to cool down the water. Where did you buy the equipment used in this video, like the glass serving pitcher & gaiwan? I know silk road teas has similar serving pitchers.